This home just outside Helsinki has front-row seats to nature’s best work. 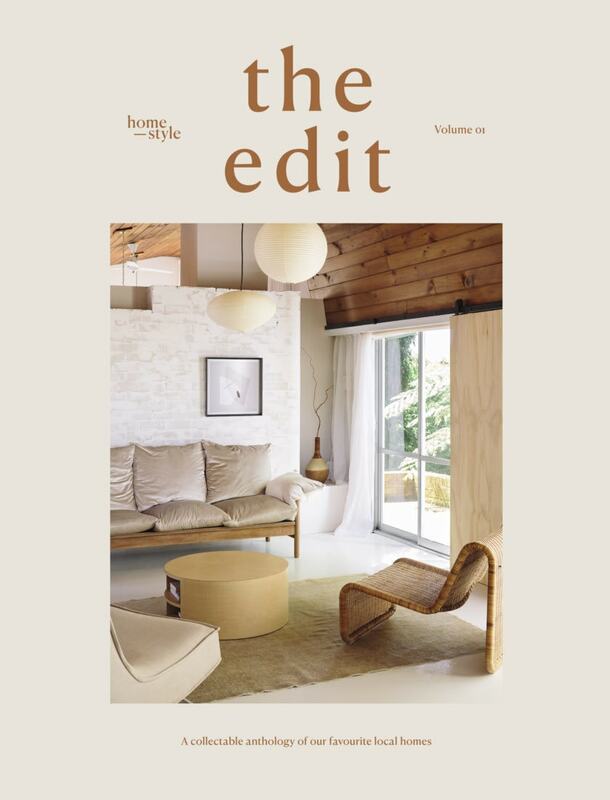 Not so long ago, Annaleena and Tuomas Hämäläinen were devoted city dwellers living in Helsinki’s trendy Punavuori neighbourhood, in a home that for 10 years had seemed like their dream come true. With a busy, active lifestyle, they loved that they could walk everywhere and were surrounded by restaurants and shops. But then their son Elmeri was born, and they began to yearn for more room and to get back to nature. ABOVE The glass-walled living area provides an unparalleled connection to nature and makes relaxation effortless; daydreaming in the hanging chair by Parolan Rottinki has become a heavenly pastime. Surrounded by tall pine, birch and juniper trees, the family’s privacy is assured, yet the huge windows let in loads of light, which allows their indoor jungle to thrive. The Lazy sofa, matching Day chair, Woody coffee table and Note organiser (on the arm of the sofa) in this space are all by Hakola, while the leather safari chair is a vintage find. Annaleena is a collector of 1968 Bumling lamps by Anders Pehrson – two are seen here, in gold (foreground) and grey (top right). 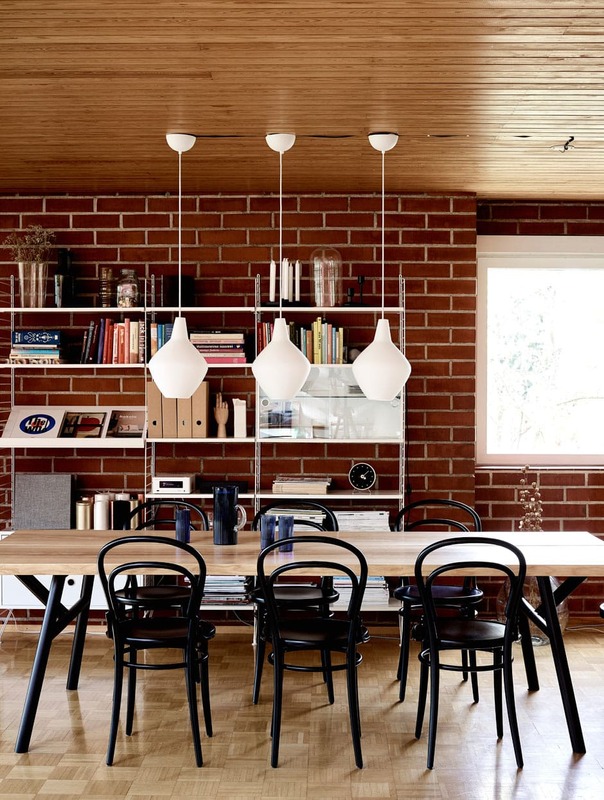 The black pendant lights (back left) are by Artek. 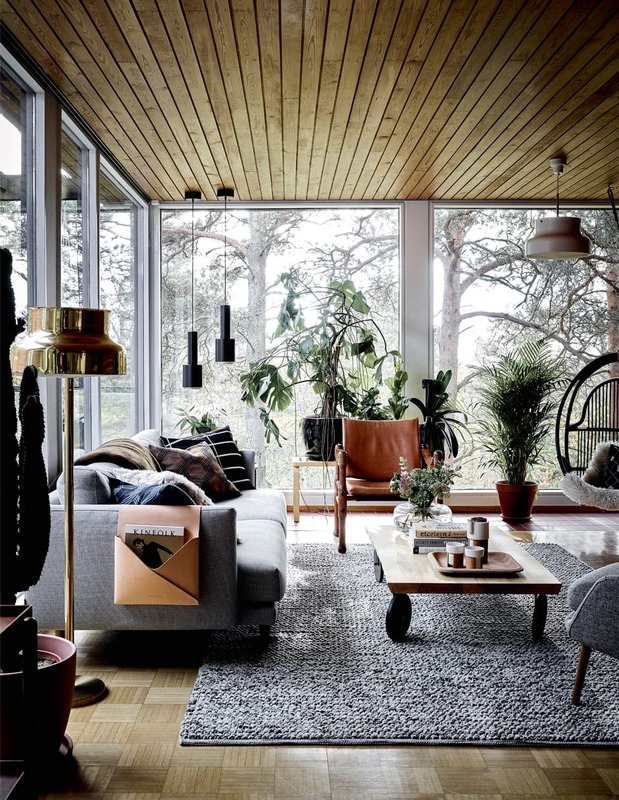 ABOVE The Hämäläinens fell head over heels for the home’s quintessentially ’60s wooden ceilings, brick walls and mosaic parquet flooring. In the office, the scheme comes together with the addition of Hakola’s Woody table – which Annaleena uses as a desk when she works from home – inky black chairs by Ton, contrasting Onion pendant lights designed by Lisa Johansson-Pape for Innolux and retro shelving by String. Designed by Finnish architect Osmo Lappo and constructed in 1963, the two-storey row house has a timeless, streamlined form. It has floor-to-ceiling windows, ticks the brick and timber boxes, and includes plenty of original detail, including an enchanting spiral staircase. The main entrance is located in a sheltered atrium that leads upstairs to the main floor and divides the open-plan kitchen/dining/living area. The lower level contains what’s basically an apartment. ABOVE Annaleena went for a sophisticated blue-grey finish for the walls in the master bedroom. 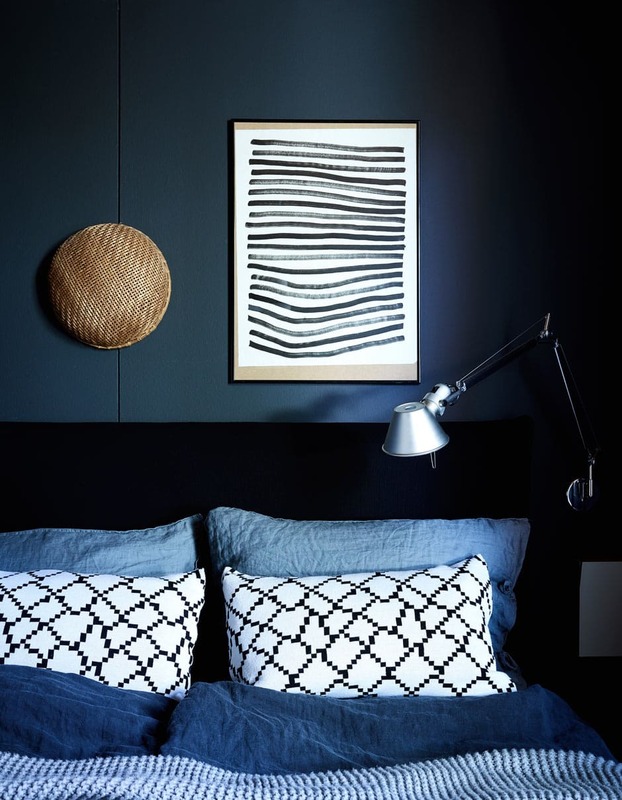 Luxurious bed linen by Balmuir, a woven basket, a monochromatic artwork by Annaleena and an aluminium Tolomeo wall lamp by Artemide combine without fuss to create a cohesive, restful scene. Some essential renovations had already been carried out to upgrade the home, and Annaleena and Tuomas were keen to stick with the original layout. 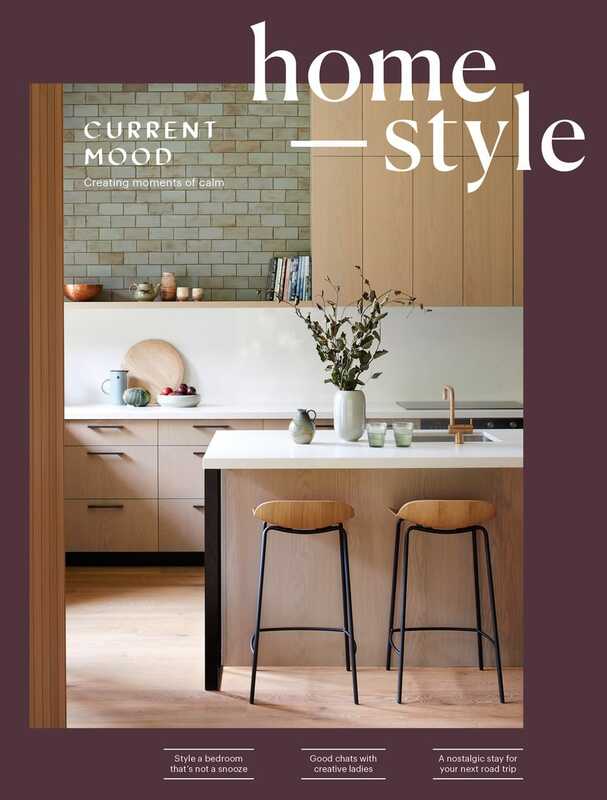 So all they opted to do was a little repainting, replace the kitchen benchtops and give the bathroom, toilets and sauna a facelift with microcement. Annaleena is creative director of family-run furniture company Hakola (which has been making furniture since the early ’60s), forming the core team with her father. Her home has been known to function as a test lab and showroom, and most of Hakola’s pieces are dotted throughout the house, some designed by Annaleena herself. 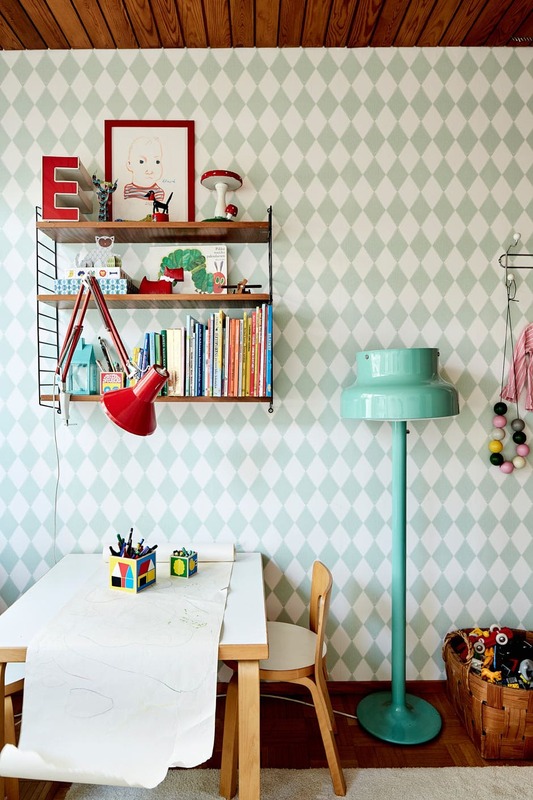 ABOVE Elmeri and Nooa’s space is a sweet mint-green haven, with tonal accents including Harlequin wallpaper by Ferm Living and a second-hand Bumling lamp found online. Shelves by String and wall hooks (far right) picked up at a fleamarket provide extra storage and the option to put items on display. The kid-size table and chairs are by Artek.